Everyone makes mistakes. Identifying them ahead of time can save you the headache. Even the simplest printing jobs can get very complicated due to everything that’s involved, and sometimes even a master makes mistakes. New technology may seem overwhelming at first, but a little training goes a long way toward getting the job done right. 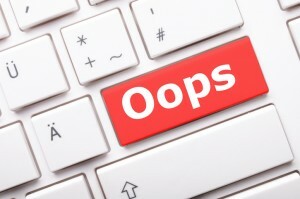 Here are a few beginners mistakes that can be easily avoided if identified in advance. Inconsistent folds in greeting cards, brochures, invitations or other business cards makes for poor presentation. Although these issues may not seem significant on a case by case basis, becoming a better printer is all about sweating the details. If your customer is paying for a premium product, they should receive premium service. There are a number of reasons why you could be experiencing poor folding. Light-weight stock or business paper works best in the folding machine, while heavier stock will need to be manually creased beforehand. You should also make sure that you folding equipment is tailored to the job in question. This is one of the most common problems in the printing industry, and something even professionals occasionally get wrong. When it comes to finishing a product, printer output can vary a great deal or even become bottlenecked. A small mistake like using the wrong stock or the wrong equipment can turn a fifteen minute project into one that takes hours. Keep in mind that post-press work is often the most labor intensive part of a job. When under time constraints, planning ahead is the most effective way to stay on top of things. Paper cracks, breaks, tears, or curls look bad and put your job at risk of rejection by the customer. Stocks heavier than 90gsm will nearly always benefit from creasing before you fold. Research what works best for your equipment, and run production tests whenever you’re having doubts. Smaller creasing machines designed specifically for short-run work can also eliminate these problems for premium jobs. Paper is not the place to cut corners on, especially if you’re delivering a premium product to your customer. Make sure that the paper you use matches customer expectations. Furthermore, digital printing equipment often comes with specific paper requirements in order to achieve the best results. If you’ve already invested in good printing equipment, make sure your paper is worthy of it! This entry was posted on Wednesday, August 17th, 2016	at 9:03 am	and is filed under Printing tips	. You can follow any responses to this entry through the RSS 2.0	feed. Both comments and pings are currently closed.